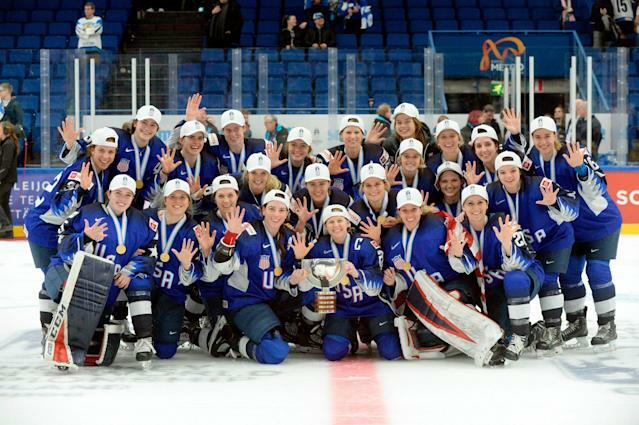 The U.S. Women’s National Hockey Team won its fifth straight gold medal at the IIHF World Championships, knocking off Finland 2-1 on Sunday. But it wasn’t without some controversy. Finland, playing in front of its home fans in Espoo, tied the game at 1-1 late in the second period. The score stayed that way through the third period, forcing overtime. Just after the 8:30 mark of the overtime session, it appeared that Finland had pulled off a big-time upset. Jenni Hiirikoski advanced the puck into the U.S. zone and fired a shot on American goalie Alex Rigsby. The shot caromed off of Rigsby’s pad and onto the waiting stick of Petra Nieminen, who sent the puck to the back of the net for what appeared to be the gold medal-winning goal. However, after a triumphant celebration and then lengthy replay review (of more than 10 minutes, per the Associated Press), the goal was taken off the board because of goaltender interference. It was determined that Hiirikoski, as she followed her own shot, bumped Rigsby, taking her out of the play. Strangely, the interference that took away the winning goal also resulted in a penalty on Rigsby. From there, the U.S. killed off the penalty and the two sides played out the extra session, prompting a shootout. Rigsby stopped four of the five Finnish shots she saw in the shootout to seal yet another gold medal for Team USA and utter heartbreak for Finland. Just to get to the gold medal game, Finland pulled off a shocking upset of Canada to halt a streak of 28 consecutive world championship finals between the U.S. and Canada. Instead, Finland went down in controversial fashion and Team USA has added yet another gold medal to its collection.